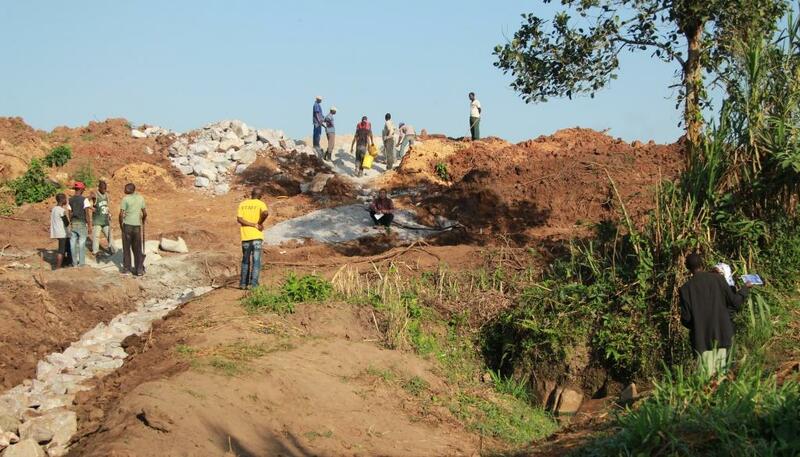 A Chinese quarrying company, China Communications Construction Company (C.C.C.C), has deprived two villages in Mukono District, Bamutakudde and Kiryamuli of their right to health and right to a clean and healthy environment. The company, which operates a large quarry in Bamutakudde and Kiryamuli villages, has been uprooting trees and tearing apart earth, polluting the stream from which the two villages collect all their water. The company practices “dry quarrying”, which throws up stone dust that throttles the villagers’ plants and gets into their lungs. The explosions used for quarrying damage villagers’ homes and give them terrible stress. The right to health means more than just getting care if you are sick. It also means living in an environment that is safe for your health and having access to safe water. CEHURD recognizes this fact, and we have brought a case to the High Court of Uganda to enforce those rights. C.C.C.C. consequently digs a trench around the water source. CEHURD visited Bamutakudde and Kiryamuli earlier in May to inspect the condition of the villages. By the time we became involved, the residents had petitioned Mukono District Local Government and held peaceful protests, to no avail. The district authorities in Mukono had rebuffed to intervene, and C.C.C.C. had promised better practices, only to break its word. Now, the torn-up earth nearly reached the stream. Much longer, and the stream would be permanently buried underneath a few tons of rock and dirt. We quickly filed a case against C.C.C.C. and the two government agencies that had ignored their duty to supervise them (Civil suit No. 172 of 2014). The environmental focus of the claim makes it especially strong. The Constitution of Uganda only mentions the right to health in its National Objectives, which Ugandan courts often decline to enforce them. The Constitution is more blunt about environmental rights: “Every Ugandan has a right to a clean and healthy environment” (Article 39). There are more detailed articles that detail the government’s duties, as well. Anyone who sees the conditions in Bamutakudde and Kiryamuli would realize that the quarry is making their environment unclean and unhealthy, so the villagers have a strong case that their rights have been violated. We also filed for an interlocutory injunction (Misc application No. 290 of 2014 (arising out of civil suit No. 172 of 2014), and an interim injunction (Misc Appln. No. 291 of 2014, arising out of Misc Application No. 290 of 2014). An interim injunction means that the registrar orders the defendant to stop doing whatever it is doing while the court considers the actual case. That way, the court’s final ruling doesn’t come too late to matter. For instance, if C.C.C.C. were to bulldoze the stream while the High Court was hearing the actual case, it might be impossible for anyone to restore the stream — so we want an injunction to make sure the stream is protected until the final ruling is made. The registrar plans to release her ruling on the interim injunction on 14th July. 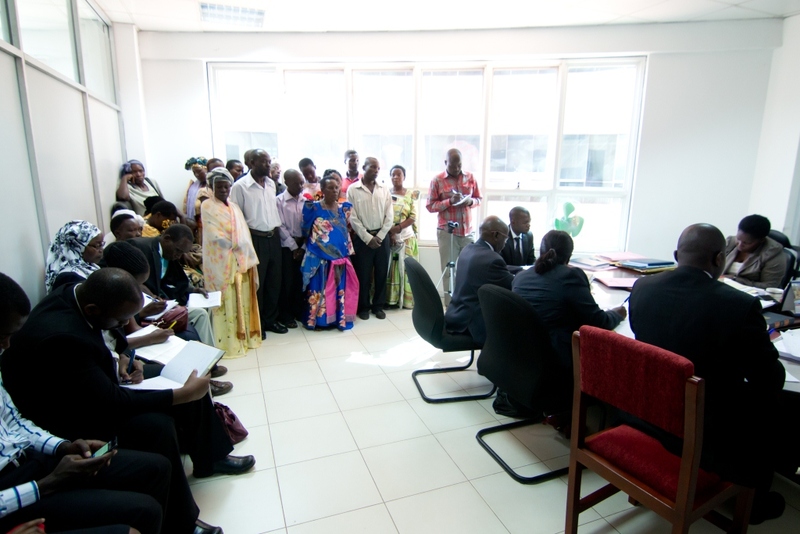 Affected residents attending a court session. Even though the court has not yet ruled on the interim injunction, much less the main case, we are starting to see practical results. C.C.C.C. has been digging a trench around the stream in hopes that dirty water will stop flowing into it. There is talk of repairing houses that have been damaged. We still need a court order, of course, to make sure that C.C.C.C. doesn’t revert to its damaging practices and to get the government to start supervising properly. Still, the practical results in the case show how litigation can advance human rights.